Benefits Mileage LABOR DAY SPECIAL OFFER Save up to $80! Get daily mileage! Benefits Mileage Discount BENEFITS IN APRIL Check out all benefits! Mileage ONLY TODAY! $300 MILEAGE Check out benefit! 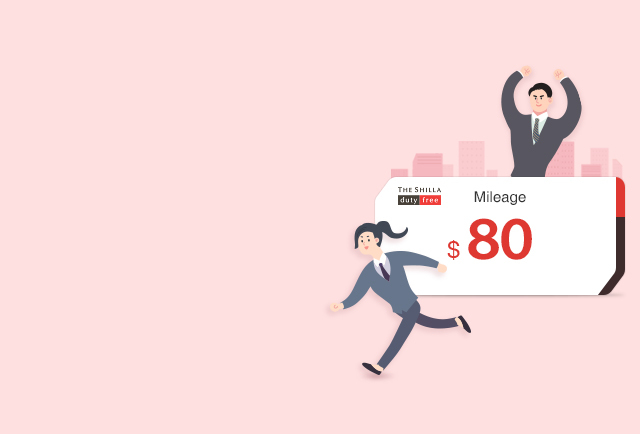 Mileage NEW MEMBERS $200 FOR 1YEAR Welcome to the Shilla! Benefits BENEFITS FOR CABIN CREW Exclusive benefit! Event KOREA TRIP INFORMATION See, eat and enjoy in Korea! Event Mileage GLOBAL INFLUENERS Watch the videos! Mileage MEMBERSHIP REWARD Check out your benefit! Event Mileage LUCKY DRAW PLAY EVERYDAY! Get up to $10 everyday! Event Mileage QUIZ EVENT TAKE THE QUIZ Get $50 mileage! Event Discount SHILLA STAY SPECIAL OFFER Get discount benefit! Event Co-marketing DONGINBI SPA 20% DISCOUNT Exclusive benefit! Event Prepaid Card SEOUL/JEJU STORE EVENT Get ￦20,000 gift card! Event Prepaid Card SHILLA AIRPORT STORE EVENT Get ￦5,000 gift card! Event Mileage GIMPO STORE PAYBACK EVENT Shop at Gimpo≥t online mileage! Event MELANO CC NEW BRAND! Double whitening care! 2001-2017 HOTEL SHILLA CO.,LTD. ALL RIGHTS RESERVED.